Just wanted to let you know a few people have asked where to get the Wavewalk, so I hope you get some orders! Having a great time with it, and I have mastered maneuvering it! This is the custom cover I ordered for my Wavewalk 700. 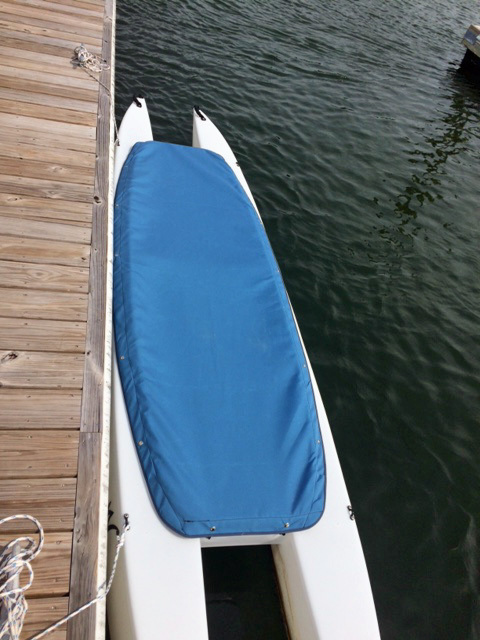 It is easy to flip the water off the cover since it is a very sturdy “Sunbrella” fabric. keeping things dry and void of debris. Wow! This cockpit cover is quality work! It really makes sense to have such a cover when you keep your Wavewalk attached to the dock, and you don’t store it on land. That’s fancy! A piece of PVC pipe with a tennis ball on top, and installed in one of the saddle holes, might give it just enough “tent” to shed the water. Nice job. I made a hard top for mine.